August 6: Elsie von der Bavarienburg is looking for a new home. Please contact me, if you are interested in this lovely girl! Elsie is high energy, excited, and playful. She loves walks, runs, chasing balls, swimming, or any activity that you engage with her. She is well behaved at home, as she has her designated bed that she goes to on command. December 28: Happy 10th birthday, Syria!!! November 4: Happy 9th birthday, Akira von der Bavarienburg!! October 6: Flannchadh von der Bavarienburg passes his IPO 3. Way to go, Thomas and Flann !! March 5: Ferrara has been bred to Arrow van het Wantij. Watch out for updates here. January 31: We are planning a new litter. More information here. December 28: Happy 9th birthday, Syria!! To many more. December 15: Happy 7th birthday, Baron Dante and Benicia (Savannah) von der Bavarienburg!! November 4: Happy 8th birthday, Akira von der Bavarienburg!! October 28: Havanna passes TR 1 with 95 points. October 20: The puppies are here ! September 23: Flannchadh von der Bavarienburg passes his IPO 2 in Denver, CO (Judge Bill Szentmiklosi). We are very proud of you, Thomas and Flann! On to IPO 3! May 24: Happy 4th birthday, G Litter von der Bavarienburg!! May 21: Happy 4th birthday, F Litter von der Bavarienburg!! May 12: Happy 7th birthday, Ferrara!! May 3: Happy 5th birthday, Havanna!! April 17: We are planning a new litter for the summer/fall. More info here. April 13: Happy 4th birthday, E Litter von der Bavarienburg!! April 1: Today we visited the Canine Congress in Oberhaching (Germany) organized by the VDH Bavaria. A distinguished panel of professors talked about Breeding, Temperament Testing and Nutrition. March 20: Happy 5th birthday, D Litter von der Bavarienburg!! December 28: Happy 8th birthday, Syria!! December 15: Happy 6th birthday, Baron Dante and Benicia (Savannah) von der Bavarienburg!! November 4: Happy 7th birthday, Akira von der Bavarienburg!! October 24: The puppies are here! September 26: Ferrara's pregnancy has been confirmed. We expect puppies around the end of October. More info here. August 14: We are planning a new litter. More info here. May 21: Happy 3rd birthday, Faro! May 12: Happy 6th birthday, Ferrara! May 8: Happy 6th birthday, Verona! May 3: Happy 4th birthday, Havanna! April 4: Our kennel has been registered with the DV. The kennel name is "Dobermannzwinger vom Haus Untersberg" and we have a new website. April 13: The WSU DNA results for the girls are back. - Syria, Ferrara and Havanna are negative for the DCM gene mutation! March 22: Capone passes away. RIP, my dear boy, you will be missed by many. February 9: Faro's hip rating is HD-1 !! January 21: Huge congrats to Mich and Kali (Francesca von der Bavarienburg) for getting her BH under USA Judge Randall Hoadley. January 16: Happy 9th birthday, Capone !! December 28: Happy 7th birthday, Syria !!! August 20: Havanna earns her BH. July 10: Ferrara gets her ZTP V1A (Judge H. Wiblishauser). June 19: Gemini von der Bavarienburg earns his BH under USA Judge Mike Caputo. Huge congrats to Maurice and Gemini!! May 22: Flannchadh von der Bavarienburg earns his BH under USA Judge Randall Hoadley. Great job, Thomas and Flann! May 21: Happy 2nd birthday, Faro ! May 12: Happy 5th birthday, Ferrara ! May 3: Happy 3rd birthday, Havanna ! February 8: Jack lost his battle with cancer. RIP, Jack! You will always be missed. January 16: Happy 8th birthday, Capone ! December 28: Happy 6th birthday, Syria ! December 21: Shiva was sent to the Rainbow Bridge today. RIP, Shiva! We will miss you. December 15: Happy 4th birthday, Dante ! October 9: Dante finishes his RE. Awesome work, Tom & Dante!! September 7: Dante earns the second leg towards his RE. One more to go!! May 30: Havanna's hip rating is back from Germany: HD-1 !! May 21: Happy 1st birthay, Faro ! May 12: Happy 4th birthay, Ferrara ! May 10: Dante earns the first leg towards his RE, coming in first in his class. May 8: Dante earns the third leg towards his RA. He also finishes his CD in style - with a first place again!!!! 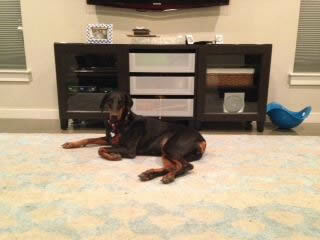 Dante was also High Scoring Doberman! CONGRATULATIONS!! May 8: Happy 4th birthay, Verona ! May 3: Happy 2nd birthay, Havanna ! April 29: Flannchadh von der Bavarienburg earns his CGC at only 11 months !!! Congrats, Flann & Tom. March 29: Baron Dante von der Bavarienburg earns the second leg towards his Companion Dog (CD) title, placing first in his class for the second time in a row. You guys rock!! March 28: Baron Dante von der Bavarienburg earns the second leg towards his Rally Advanced (RA) title. He also earns the first leg towards his Companion Dog (CD) title, placing first in his class. Huge congrats, Team Tom & Dante!!! March 2: Ferrara earns the VC (Versatility Companion) title. February 28: Faye von der Bavarienburg at her first show: V3 in Groningen, Holland. Full results. February 21: Havanna earns her AD under USA Judge Ann Marie Chaffin. February 20 & 21: Ferrara earns her VPG 2 (98/93/90 p) under USA Judge Ann Marie Chaffin. She goes High Tracking, High Obedience, High Protection, High in Trial. January 16: Happy 7th birthday, Capone ! December 28: Happy 5th birthday, Syria ! December 13: Syria earns her TR 3 (92 pts.) at the Tucson Working K9 Club Trial under USA Judge Ernest Hintz. Capone's daughter Kai, owned & handled by Lynn Ballard, earns her BH under SV Judge Klaus Friedrich. Way to go, girls!! December 6: Caydi von der Bavarienburg earns her BH under SV Judge Dr. David Landau! Her handler Fara does a fantastic job and receives the High BH award! Way to go!! December 5: Ferrara earns her IPO 1 (96/89/85 p) under SV Judge Dr. David Landau. She goes High Tracking, High Obedience, High Protection, High in Trial. Video of Long Bite. October 17: Baron Dante von der Bavarienburg earns the first leg towards his Rally Advanced (RA) title, coming in first in his class. Way to go!! October 16: Baron Dante von der Bavarienburg finishes his RN title in style with a second place! On to Rally Advanced, guys! September 1: Baron Dante von der Bavarienburg earns the second leg towards his RN title. One more to go. Congratulations!! August 31: Baron Dante von der Bavarienburg earns the first leg towards his Rally Novice (RN) title. Congratulations!! August 10: Daisy von der Bavarienburg earns her CGC certificate. Congratulations!! August 3: Baron Dante von der Bavarienburg earns his CGC certificate. Congratulations!! May 12: Happy 3rd birthday, Ferrara ! May 10: Caydi von der Bavarienburg earns her CGC certificate. Congratulations!! May 8: Happy 3rd birthday, Verona ! May 7: Ferrara's Holter recorder results are back and normal: 0 VPCs during the 24-hour recording on 04/29-04/30/08 ! May 3: Happy first birthday, Havanna ! May 1: Syria's Holter recorder results are back and normal: 0 VPCs during the 24-hour recording on 04/26-04/27/08 ! April 26: New pictures of Dante uploaded. April 18: Ferrara's hip rating is back from Germany: HD-1 !! March 14/15: Syria earns her VPG 3 at the Tucson Working K9 Club Trial under USA Judge Johannes Grewe. February 27: Syria and Ferrara pass the Working Aptitude Evaluation (WAE) with flying colors. The event was hosted by the Desert Valley Doberman Pinscher Club in Scottsdale, AZ, with DPCA Evaluator Eve Auch. You rock, girls! February 8-10: Ferrara earns her VPG 1 at the Southwest Regional SchH 3 Championship at the Phoenix Schutzhund Club in Phoenix, AZ, under SV Judge Elmar Mannes & Canadian SV Judge Doug Deacon, placing third in this category. She is also High Dobermann. January 16: Happy 6th birthday, Capone !! !